It’s all too easy to overlook proper and regular dehumidifier maintenance, but this can lead to downtime and in some cases costly repairs. Planned maintenance begins with—a plan! When there's no plan, the result is inconsistent procedures. Be sure to focus on the two main places where dirt collects—the pumps and coils. Cleaning them is crucial—it's where you make the most significant impact. 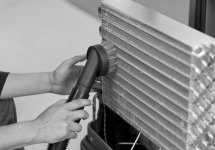 It’s especially important to replace dehumidifier filters and clean coils after any job that involves excessive dust or debris. And if you get an ER9 control panel code and the hose isn’t kinked, it could be that the pump has become clogged with debris and needs cleaning or replacing. Fortunately, all newer Dri-Eaz dehumidifiers are designed to be fast and easy to disassemble for cleaning and maintenance. Check your owner's manual for instructions. No matter what dehumidifiers and equipment you use, the better care you take of it, the better performance and life you’ll get from it.